Raising Stanley / Life With Tulia, is a collaborative performance and exhibition that describes the journey from puppy to working guide dog for the blind. 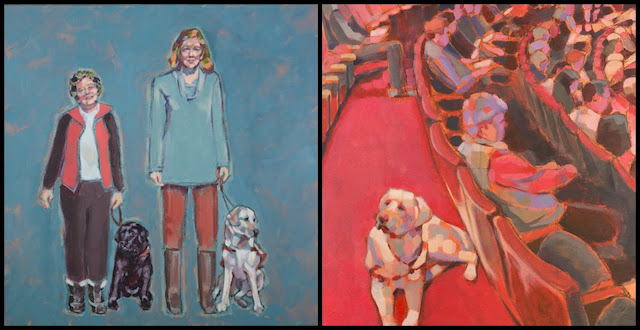 Karen Bailey painted Stanley, a guide dog puppy she and her husband raised for Canadian Guide Dogs for the Blind, engaged in a multitude of activities that mirror his future working life. Karen will recount the process of creating her paintings of Stanley and her unusual collaboration with Kim Kilpatrick, a blind storyteller, who performs stories of life with Tulia, a working guide dog. Their accessible production combines storytelling, painting and video and will be presented in the Studio Theatre and Fritzi Gallery of the Great Canadian theatre Company in the summer of 2018. Karen Bailey’s diverse career spans three decades. Many of her acrylic paintings feature behind-the-scenes workers and the under-recognized including waitresses, hairstylists, church tea ladies and service dogs. She traveled to Afghanistan in 2007 as an appointed military artist to document Canadian military medical personnel at the Role 3 Hospital in Kandahar. Her official portrait of the Right Honourable Michaëlle Jean, 27th Governor General of Canada, was unveiled at Rideau Hall in 2012. Fogo Island, Newfoundland is the inspiration for her current work-in-progress. Richard Pell is currently exhibiting at the Lunasole Restaurant, at 5935 Jeanne D'Arc Blvd. It's time to change the exhibition of artworks at the Orleans Library, 1705 Orleans Blvd., Orleans, Ontario. July 3, 2018. The changeover at the Orleans Library is between 10:30 a.m. and 11:30 a.m. There are no hanging fees for the Orleans Library Exhibitions. Please be prepared to record the following information on the back of your paintings: title; medium; size; and, price; along with your name, phone number and e-mail. You can bring up to five (5) paintings although, depending on the total received, not all may be accepted. Paintings must be properly framed and ready for hanging. For those of you who are bringing in paintings for the first time this year, there is an Arteast contract you must sign. Blank contracts will be available then at the Library from the coordinator. Grow with Art is organizing a glass fusing workshop with Jennifer Anne Kelly of Current Works of Glass. We hope to organize a carpool for transportation. Cost: Everyone would pay the fee of $40 or $45 for their project. We could then go as a group for lunch in Cumberland. The lunch out would be optional and an individual expense. Numbers: about 8 people (If fewer than 5 we will cancel) If more people sign up we will have an afternoon session as well. Season 2 of the Emmy-nominated series "Genius" tells the story behind Pablo Picasso, one of the 20th century's most influential, controversial, and celebrated artists. Also explored are the muses who inspired him. Starring Antonio Banderas in the titular role, hourlong episodes explore how the Spanish-born Picasso's passion and creativity were inseparably linked to his personal life, which included tumultuous marriages, numerous affairs and constantly shifting political and personal alliances. La saison 2 de la série "Genius", mise en nomination aux Emmy Awards, raconte l'histoire de Pablo Picasso, l'un des artistes les plus influents, les plus controversés et les plus célèbres du 20ème siècle. Les muses qui l'ont inspiré sont également explorées. Mettant en vedette Antonio Banderas dans le rôle principal, des épisodes d'une heure explorent comment la passion et la créativité de Picasso étaient inséparablement liées à sa vie personnelle, qui comprenait des mariages tumultueux, de nombreuses affaires et des alliances politiques et personnelles constamment changeantes. When it comes to acrylics, Liquitex started it all in 1955. In this demonstration attendees will be introduced to the acrylic brand that has been on the forefront of innovation for over 50 years. As the #1 acrylic in the world Liquitex is the only brand to offer the most diverse range of professional products including five unique ranges of professional acrylic colors, innovative mediums, and a revolutionary range of painting tools to meet the needs of every artist. 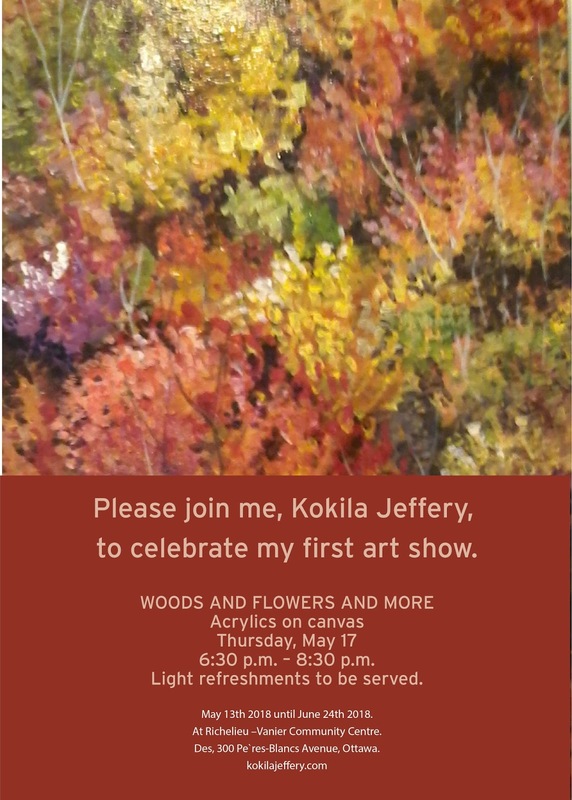 This demo is all about getting people excited about the endless possibilities of acrylic color and mediums so they can go right into the studio with tons of new ideas. Each attendee will receive a sample pack of Liquitex Artist Materials! DeSerres - Trends: A new take on Japanese art!